If you want to manage a number of different 360° feedback projects for different clients or for different departments in your organisation then you need this. The Trainer Manager helps you to maintain overall control and to manage and distribute your licenses between the different trainer accounts. It will also enable you to manage your portfolio of different types of questionnaires and control who is allowed access to which questionnaires. Where a number of people each are responsible for running 360° projects you can bulk purchase licenses and distribute them between multiple trainer accounts or project administrators. 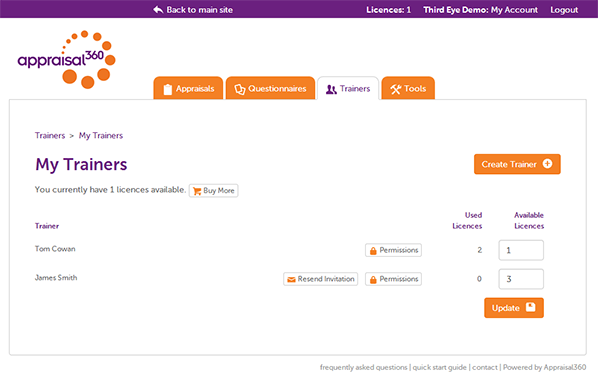 Use the “permissions” control to determine which questionnaires any given trainer is allowed to use and assign your available licenses to the different trainers by changing the numbers adjacent to each. You can create new trainer accounts with the “Create New Trainer” control. Managing multiple accounts and projects is easy with the Trainer Manager account and it’s an invaluable tool for consultant trainers who manage projects for various clients and need to set up separate accounts for each, but who still want the advantages of bulk purchasing of Appraisal360 licenses.